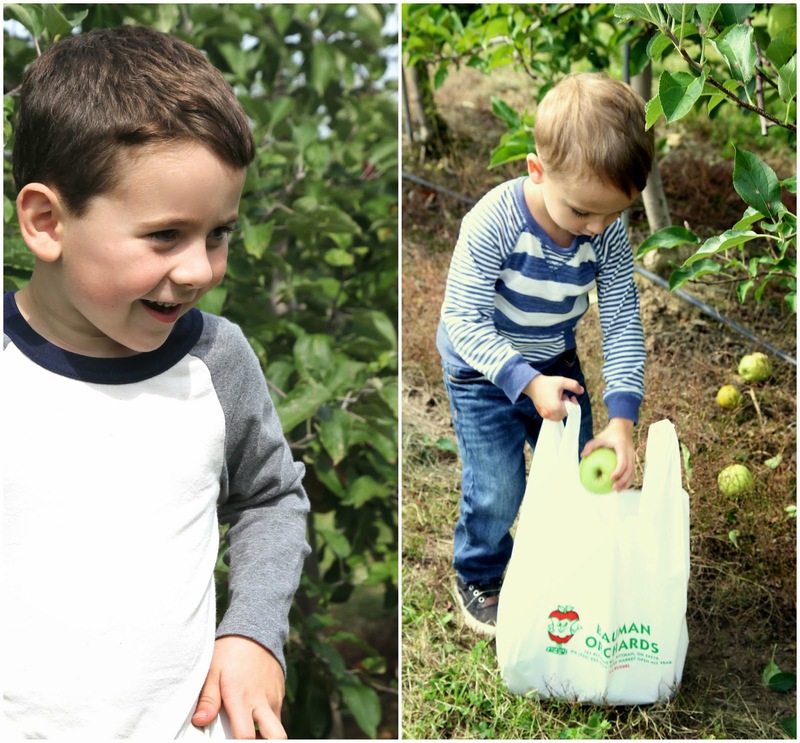 We kicked off my favorite season with apple picking over the weekend at our local orchard's annual fall festival. 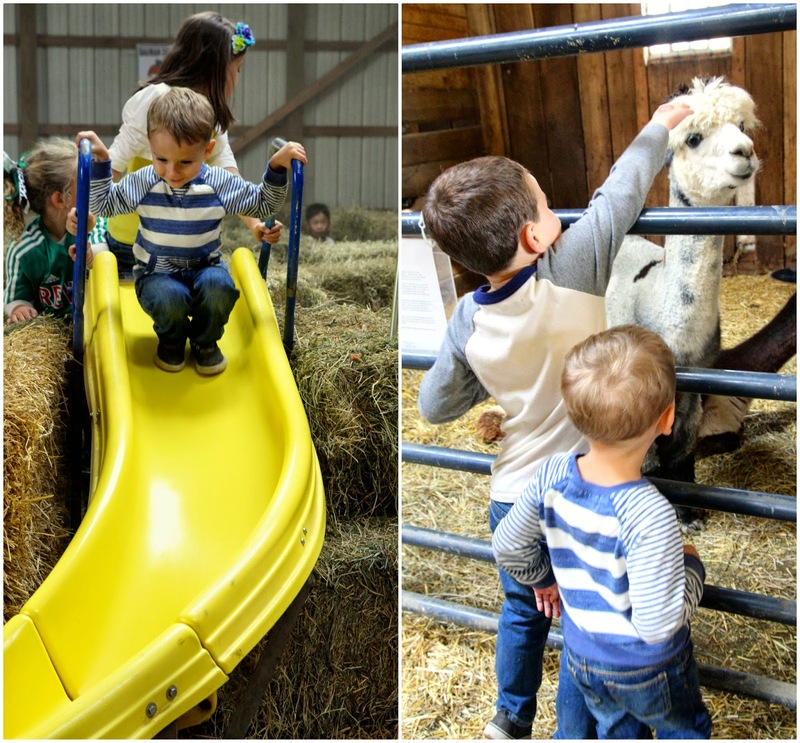 There was homemade cider and hot donuts, pony and hay rides and even a petting zoo, The boys had a blast needless to say and it made me so excited for everything we have to look forward to in the coming weeks. Pumpkin carving, and costumes and new babies, oh my! Fall we are so ready for you! I am sitting myself down to write a blog post. Yes. No more excuses today. Of course things are busy, but things are always busy. So, I am making the time. Now, what to write about? There has been so much going on in the world, scary, horrible, frustrating things that I should probably be writing about -- no, I KNOW I should be writing about, because discussion is good. And talking about things is the first step to changing them. But to be honest with you I can hardly get through a day without crying about my own stuff right now (which I realize are mostly silly, trivial and definitely hormonal problems). So I have been sort of hiding out in my own little shell with blinders on trying to ignore the news as best I can for the next little while. Because I am so tired of crying you guys. No one likes a complainer and positivity is key, right? So let's visit some of the good and wonderful. I have been making time for friends. Breakfast with a girlfriend whom I haven't been able to connect with in far too long and an adults only over night trip to celebrate another friend's birthday have been oh so good for the soul lately. And Josh, in his infinite wisdom, has even set up a dinner at our house Sunday night and invited a couple we're acquainted with and their two little boys. It's a sort of first date, potential friends in the making, we hope you like us because we like you kind of deal. Because it's hard to make new friends as an adult, isn't it? "And we need more friends that live close by!" says Josh. And you know what, it's true. So Josh just went for it. We're going to be vulnerable and make them a lasagna and just put ourselves out there and see what happens. Anybody else out there wanna be friends in real life? Let's do this! Our house has been getting some much needed TLC. We've been finding ourselves with a bit more free time on our hands now that summer is winding down and most of the weddings and grad parties have been attended. We've got the nursery about as finished as it's going to be before the baby comes. The shelves and walls are still mostly empty since we're waiting to find out if our little "E" is a he or a she, but the furniture is in place, the walls have been painted, the new light is installed. This weekend we tackle the baby's bathroom. New sconces have been ordered and Josh is going to finish up the painting. I promise a full tour of both rooms once baby is here and we really finish the place. I seriously can't wait. Josh has also been tiling, grouting, fixing leaks and being a general handy-man extraordinaire the last few weeks. We took our first steps towards updating our enormously tall two-story rear stairwell with the purchase of this AMAZING ladder (seriously though, I never thought I'd get so excited over owning a ladder) and this beauty of a light fixture. ...two points here while I'm thinking about it...when I link to something online please don't ever think I actually paid the list price you see for anything for our house. I'm lucky enough to have a job where I can get house stuff at wholesale prices straight from the manufacturers themselves. (I just don't want anyone out there mistakenly thinking I'm miss richy rich over here ;) Also, my mom is crazy. Wonderful, but crazy. And she kicked in a good portion of the money for that light fixture as an early christmas present. Because she starts christmas shopping in August, y'all. And whenever a gift giving occasion rolls around and she asks me what I want, I always inevitably answer a new light fixture for somewhere in the house. So she told me to go ahead and get it ordered. And now it's here and I loooooove it. And Josh used the new ladder to install the new fixture and now I'm dying to start the painting. Unfortunately, painting from a ladder two stories up whilst 33 weeks pregnant does not seem like the wisest decision. So, that's going to have to wait just a little while longer. Our loooong search for a new dining room table has finally come to a happy end. The dining table we've had forever was an undeniable POS. I bought it online from Pottery Barn on final clearance for like $400 years ago. When it showed up the finish was already flaking off in some areas before I'd even gotten it assembled. Of course they wouldn't take it back or replace it because it was final clearance, so we've been stuck with it ever since. In addition to the already spotty finish the boys have added their own little touches to it over time in the form of permanent marker and glitter glue. So, yeah, we needed something new. Problem was everything I was drawn to had a super smooth polished finish to it. I needed something that could get a little beat up. A table that wouldn't show every single scratch or mark. I mean, I don't plan on letting them anywhere near a new table with glitter glue ever again, but they are going to be using it for homework and eating and whatnot and it's bound to take a few hits. Then I discovered Ariele Alasko. If you haven't heard of her she's this amazing wood worker and furniture builder who makes all these great custom pieces from reclaimed wood (technically plaster lath) that are just drop dead gorgeous. I'm serious, she is an incredible artist. Her stuff is amazing, and wouldn't you know she does dining room tables. Well, technically, she did dining room tables. She doesn't anymore, and she's not currently taking commissions nor am I a bajillionaire who could afford to commission a custom Ariele Alasko dining table. (I wish.) But, it did get me thinking. Maybe I could find someone who IS taking custom commissions and also works with reclaimed wood. I mean, it's already a bit beat up, so the boys can't really hurt it, and that's part of the beauty and charm of these pieces anyway, right? So to Etsy I went and that's where I found Sarah at New Antiquity. After a few good conversations about color and design she understood what I was looking for and drew up a custom dining table for me that was just about the prettiest thing I ever did see. She has been a dream to work with and even sent me progress shots of the table during the construction process to make sure things were looking correct and so I'd know we were on track. AND tomorrow's Friday? Things are certainly looking up around here. See, there's plenty of good and wonderful when you just take the time to look for it. I think I should just end this post on that note, right? Proud new owner of her dream dining table out! 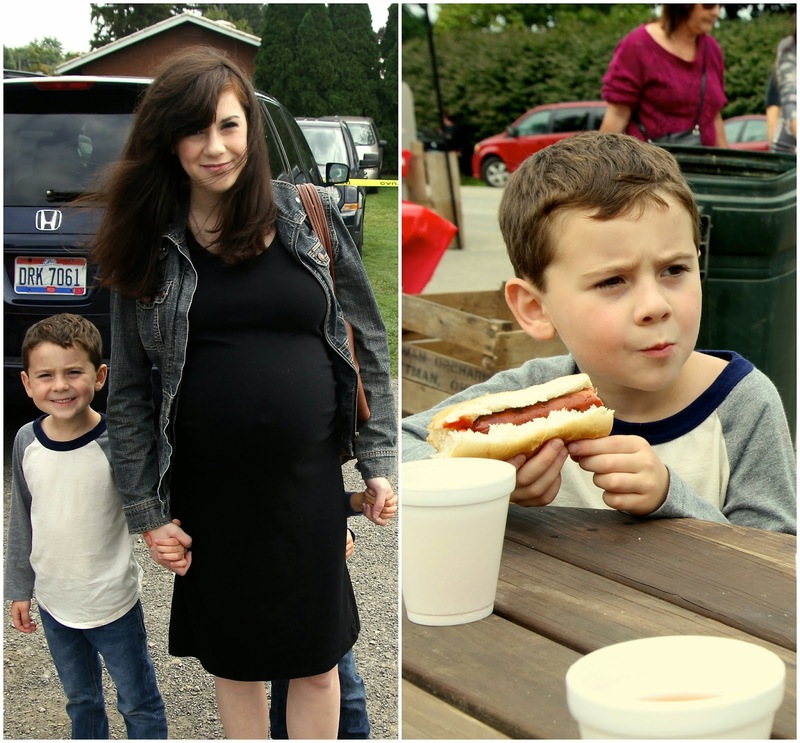 I have been so bad at documenting this pregnancy. Actually, I am bad at documenting all my pregnancies and have only a handful of pictures of my growing belly from each of them. So here I am, dutifully documenting week 32 for the sake of posterity. How I should be feeling at 32 weeks pregnant is happy, glowing, grateful. How I actually feel at 32 weeks pregnant is done. Which is unfortunate because I still have about eight weeks to go (seven if this little cub is anything like his or her brothers). Josh keeps saying, "only two months to go!" and I keep telling him to stop counting in months. Baby kicks. The best part of pregnancy by far. This baby is actually pretty chill, maintaining a steady stream of calm but consistent movement which helps to keep me from worrying. Oren loving on the baby. He kisses my belly constantly, is adamant that there's a sister in there for him (Wes is still pulling for a boy, so someone is sure to be disappointed) and seems really into the whole pregnancy and baby idea. He is such a lover and I can't wait to see him with the actual baby. All seems well. Glucose test came back fine, blood work was good, baby is measuring correctly and I've had no crazy or out of the ordinary symptoms or complications thus far. Fingers crossed we continue to be so lucky. Braxton hicks all day err'y day. This is a first for me to experience this many, this frequently and this early in pregnancy. I had them a lot at like 38 weeks with the boys, but not even close to the amount I have been having with this babe already. They don't hurt, but man are they uncomfortable. Especially the other day when they were coming like every five minutes for an entire day. No amount of water consumption or moving around would calm them and having my belly turn hard as a boulder off and on all day while trying to work and sleep was very distracting. Heartburn and indigestion. Tums are my new best friend. I never had this at all with my guys before so I've been kind of surprised by this one. Doesn't that mean baby will have a full head of hair or something? I have had two dreams, one where baby was a boy with thick black hair, and one where baby was a girl who had a face just like Wes's but with a mop of curly blond hair. So, maybe that means this kid is destined to have a wild mane of hair upon delivery? We will know soon enough. What are the hideous blue veins I found bulging out of the back of my right thigh two days ago?! I suspect they've been there awhile and I've just now discovered them. It's not often I get a glimpse of much of what's going on below the belly button these days and I was shocked upon this discovery. I shouted for Josh to hurry over and inspect them whilst having a mini panic attack about the possibility of them being permanent. ARE they permanent? Just don't tell me, it's better if I don't know. No sleep. I'm not even going to get into the insomnia discussion again because I'll start to cry just writing about it. Just know that it is easily the most frustrating thing in my life right now. I know I won't be much more (if any more) rested when the baby comes, but at least I'll have a tangible little baby to snuggle with through the long hours of the night instead of my ridiculous pregnancy pillow. And I'll be on maternity leave. Which miiiiight be two greatest words in the english language. Now THAT I'm looking forward to. Anyone else out there in the last stretch of pregnancy? How are you holding up? I'd love to hear/have someone to commiserate with. And I know we (I) will get through and I know how lucky I am to even be here in the first place. I mean, I've got a baby waiting for me at the end of this marathon, and I can't think of anything more worth the trouble. So, let's do this. We can totally do this. Carry on sisters, carry on.